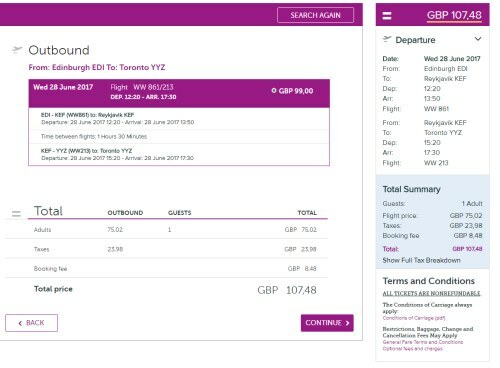 WOW Air is once again showing some really cheap one way flights from Toronto to Europe for $75 CAD including taxes. Unfortunately there's not many cheap one way flights from Europe to Toronto in June at the moment. 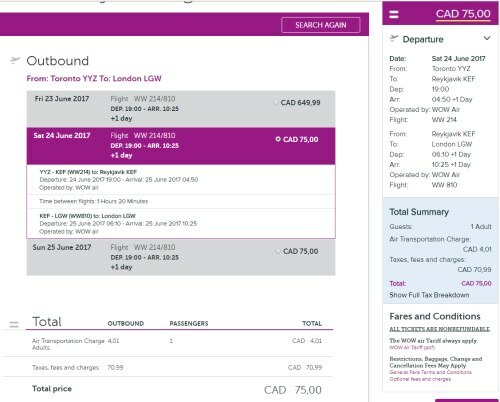 There's a one way flight from Edinburgh, Scotland to Toronto on June 28 for $189 (flight only) to $285 CAD (with checked bag). 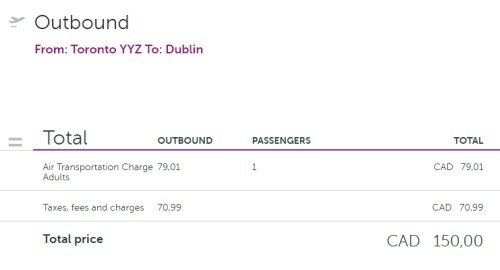 There's one flight from Cork, Ireland to Toronto on June 21 for $114 CAD (flight only) to $203 CAD (with checked bag). 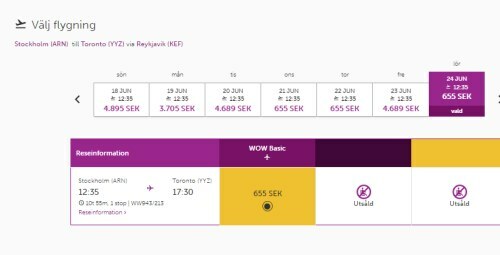 There's a few flights from Stockholm, Sweden to Toronto on June 21, 22, or 24 for $123 CAD (flight only) to $215 CAD (with checked bag). Select June 21, 22, or 24 as your date. 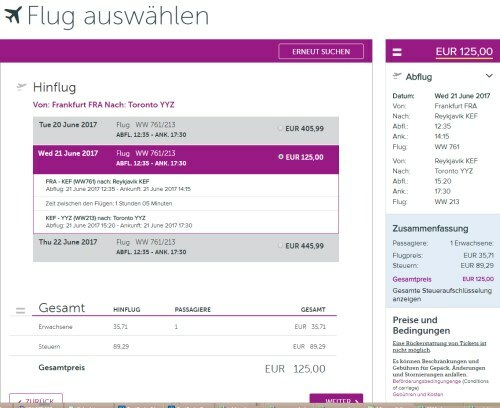 There's flights from Frankfurt, Germany to Toronto on June 21 for $209 CAD (flight only) to $298 CAD (with checked bag). There's also a few one way flights from Brussels, Belgium to Toronto in June for $209 CAD (flight only) to $304 CAD (with checked bag). Try June 20, 21, 23. There appears to only be 1 seat available on each date. The flights should show up as 125 Euros. Multiply the Euros by 1.54 for prices in $CAD. Change the city to one of the cities listed above. Click on the departure date box to select other dates. Look for the dates that are $75 CAD. 2. Select your flight and click through from Google Flights to the WOW Air website. 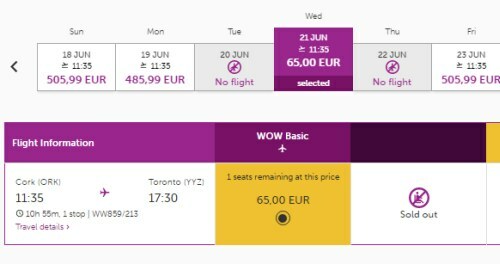 Update 6/29 - Today, WOW Air is offering one-way flights from Toronto to Europe for July and August travel for $150 (flight only) to $240 (with luggage) CAD including taxes. Unfortunately there's not really any cheap one way flights back home from Europe to Toronto in July or August. There's also a few pretty decent *roundtrip* prices from Toronto to Edinburgh, Scotland (EDI) or Stockholm, Sweden (ARN) in August for $520 (flight only) to $670 (with luggage). Other airlines are around 1.5 to 2X the price for August travel. 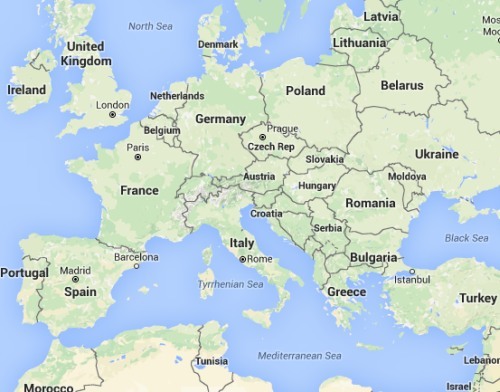 10 Responses to "One way flights from Toronto to Europe - $75 to $165 CAD including taxes"
I don't see any flights at all. It appears the WOW Air website might be straining under the traffic hitting it right now. Fares aren't loading at all at the moment. Honestly, Chris, this is one of your best posts. 'Unbundling' or separating the flight cost from the luggage cost is likely the future of many airlines, even here in North America. May as well get used to it. Just need to do the math to see if it's still a good deal. $165 with a checked bag for a one way flight to Europe is still a pretty amazing price. Which flights have a one day layover? All the flights I saw to Europe had about a 90 minute to 2 hr connection in Iceland. Thanks Chris for all this up front info, really different people different stroke when you are looking for flight traveling! It may not fit into everyone preference, but still is a great source for those who need help on their travel planning. Thanks again!